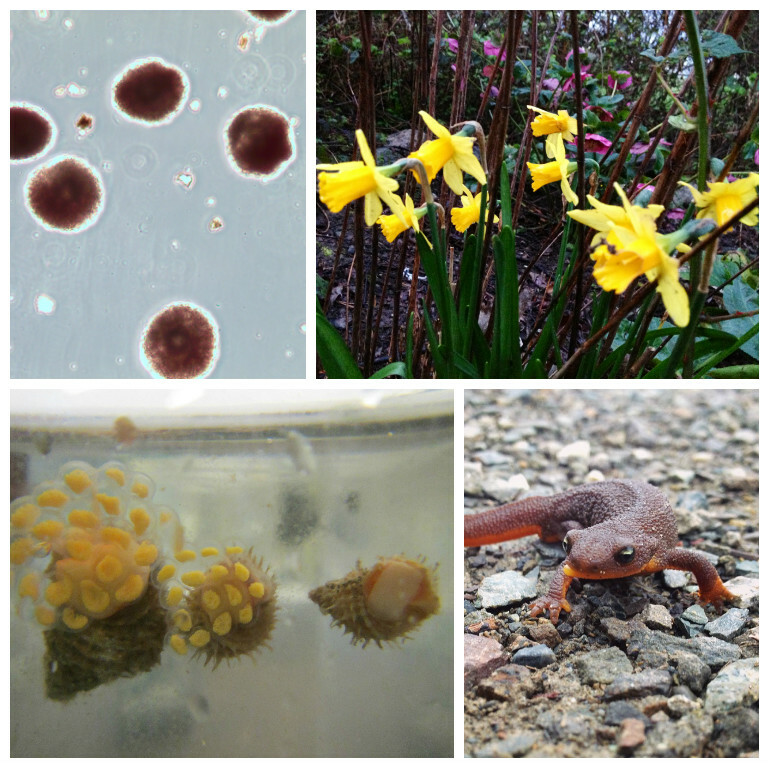 PTMSC Blog : Spring has Sprung! Some people look for the first daffodil blossom. Others listen for bird song, count the hours of sunlight, or await the word of a clairvoyant rodent. Here at the Marine Science Center, we use other markers to note the beginning of spring. These days, the winds are high but the clouds break once a day, letting us know that the seasons are changing. We hear the twittering of bald eagle pairs above the Marine Exhibit and note the movements of sanderling flocks. We watch the snow in the mountains, hoping it’ll stick around. The schools of juvenile tubesnout are back and the water is clear enough to see the river otters chasing these shimmering fish around the pilings of our pier. The first animals to lay eggs in the Marine Exhibit were the checkered hairy snails. These spikey kleptoparasites laid tens of packets filled with hundreds of tiny, yellow eggs. Soon afterward, the Marine Exhibit was awash in new life. The anemones started to spawn; tan eggs released by the thousands. The next day I found egg ribbons from the bushy-backed nudibranchs and an egg sponge attached to the belly of a pygmy rock crab. Even the spaghetti worms are feeling the pull of the warm water! Spaghetti worm eggs are Pepto-Bismol pink and were released in gooey pulses. There are also mystery eggs galore in our tanks! Puddles of peach-colored spawn in the touch tanks, green egg spirals in a wall tank, and water that teams with twitchy larvae growing into who-knows-what. and three checkered hairy snails with eggs. For the AmeriCorps team, the coming of spring means it’s time to wrap up our winter projects. Zofia has finished organizing the Citizen Science data and Carolyn is adding the final touches to some spiffy new content for the Natural History Exhibit. We have all taught our last Free Science Classes, which Katie gracefully and efficiently coordinated. And I am done buffing. Buffing is the tedious process of cleaning, removing scratches, and polishing our large, acrylic tanks. Over the course of three months, the tanks have gone from clear-as-mud to shining-like-diamonds and now they are ready to house a new batch of marine animals (not including a folded up AmeriCorps member) and ready to welcome visitors once again for Spring Hours this Friday at noon! All the evidence points to one conclusion: Spring has sprung! It is a delight to serve at a site that encourages such a close connection between individuals and the natural world around them. As I continue to work in outreach and education, I aim to inspire conservation and increase a sense of connection between the people and the environment I serve. And every sunny day, I feel that sense of stewardship and interconnectedness growing within myself as well. REBECCA MOSTOW is the Marine Exhibit Educator and an AmeriCorps member serving at the Port Townsend Marine Science Center. The Marine Exhibit opens this Friday for Spring Hours! Come say hello to the resident animals, and get ready to meet some brand-new critters! The exhibits are open Friday-Sunday, 12-5 pm. Yay! Spring! Thanks Rebecca. Anxious to see the sparkly tanks.